Rockstar will be starting the afternoon in The Lost and Damned in Team Deathmatch. And to those of you that want to get your Buzzard on, or just can't wait to jump off a building in Liberty City, wait up as they'll be supplying parachutes when they switch over to The Ballad of Gay Tony. Can't reach a gaming PC during our play time? You can still follow everything at the Social Club Multiplayer Event page with a live streaming broadcast on both days. Rockstar will also have the chat box running during the events for those that want to discuss the action with fellow fans. We'll be starting the event in Team Deathmatch in The Lost and Damned, so navigate through your in-game phone to Party Mode and have at least one friend join your Grand Theft Auto party. Once you and your friend(s) are ready and you're sure that the event has begun, start up Team Deathmatch. Rockstar players will be scattered through a number of different lobbies to allow for the maximum amount of people to play on each day. As always, shout in our chat box on the Social Club Multiplayer Event page if you have any questions. Hit up the chat box during the event or plan ahead and coordinate your party by posting your Gamertag in the Comments section below. To get started, fire up the in-game mobile phone by pressing "Up" on the D-pad. Navigate to Party Mode. From here, open up your phone again and select the Friends option to invite your friends (you need at least one more friend to play with Rockstar). Once your team is ready to roll and the event has begun, open up the in-game phone again and select Ranked > Team Deathmatch. Again, please be sure that you enter the first lobby in a group of two if you plan to get matched up against us and other players for the event. Sounds like a blast! Be sure to check out the various Grand Theft Auto sections of this site for info, images and guides for your favorite GTA game! 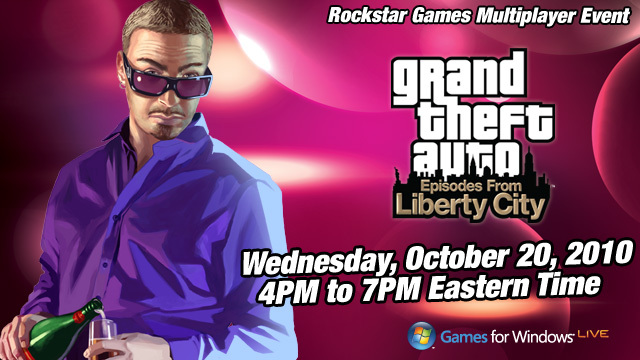 And join the next GTA discussions in our Grand Theft Auto forums!